The hotel is spread over 70000 sq. feet with multiple dining options and 480 rooms. Overlooking the pool, Cafe Knosh serves Middle Eastern and international fare and it also features a pizza oven, utilized for baking breads, brioches and more. Revisit the ‘Mughal Era’ with the live kitchen at Dilli 32 or the Orient with Mei Kun’s favourites like Singaporean Chili and Massaman Curry. Enjoy evenings with views of the garden and fountain at Cherry Bar, as cocktails, malts and finger food follow. Discover a world of gourmet food, luxurious stays and indulgent living with Connoisseur Club, the food and beverage based loyalty program of The Leela Palaces, Hotels and Resorts. One (1) diner per table – 20% discount. Two (2) diners per table – 50% discount. Three (3) diners per table – 33% discount. Four (4) diners per table – 25% discount. Five (5) to twenty (20) diners per table – 20% discount. 20% discount on all alcoholic and non-alcoholic beverages. 20% discount on take-away Bakery items. 20% discount on Sunday Brunch. Happy Hours – Buy one drink and get another one complimentary on selected alcoholic beverages between 5 pm and 10 pm up to a table of six (6) guests at the Cherry Bar. 20% discount on Spa & Salon. 15% discount on Best Available Rates for rooms. One (1) certificate entitling the Member to a complimentary buffet lunch for two (2) guests at Cafe Knosh valid from Monday to Friday . This benefit is not valid over Sunday Brunch and on public holidays. This certificate is non-transferable. One (1) certificate entitling the Bearer to a 50% discount on Sunday Brunch on a table of up to eight guests. This benefit is valid at Café Knosh. One (1) certificate entitling the Member to a complimentary 1 Kg Cake while dining at any of the restaurants at the hotel. One (1) certificate entitling the Bearer to a 50% discount on a take-away Cake (Minimum 2 Kgs and maximum 5 Kgs). One (1) certificate entitling the Bearer to a complimentary night stay in a Premier Room inclusive of buffet breakfast for two (2) guests at Cafe Knosh (valid on Friday, Saturday or Sunday). This benefit is valid for one room on a double occupancy basis and for one night only. Reservations must be made in advance and are subject to room allocation availability. This benefit is valid at The Leela Ambience Convention Hotel, Delhi only. 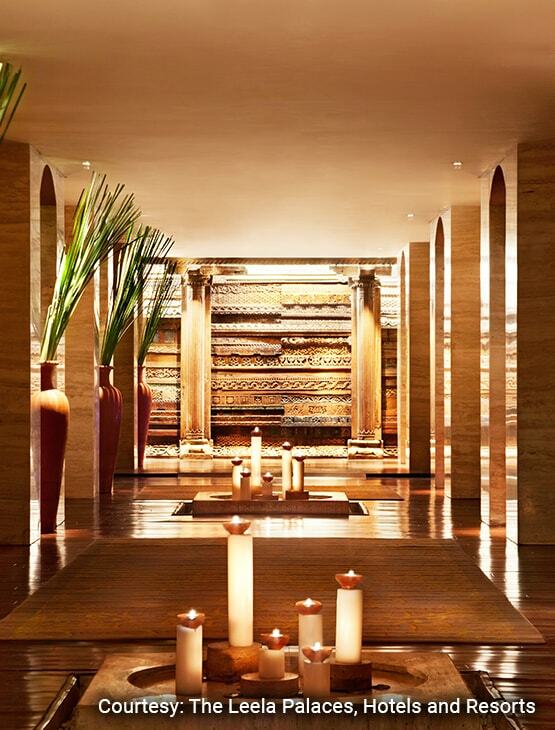 Two (2) certificates entitling the Member to a 50% discount for a one hour therapy at Shanaya Spa. Valid for one (1) guest from Monday to Friday. This certificate is non-transferable & not valid on special packages and Ayurveda therapies. Prior reservations must be made clearly stating the use of this benefit. The above- mentioned discounts on Food bill, a 20% discount on soft beverages and a 15% discount on alcoholic beverage bills can also be availed at The Leela Palace Bengaluru, The Leela Mumbai, The Leela Ambience Gurugram Hotel & Residences and The Leela Raviz Kovalam. 20% discount on the food & soft beverages, and a 15% discount on alcoholic beverages while staying at The Leela Goa, and The Leela Palace Udaipur. Card benefits are not applicable at The Leela Palace New Delhi, The Leela Palace Chennai and Le Cirque Signature restaurant at The Leela Mumbai. Benefits at Partner Hotels are not applicable on Blue Level Membership. 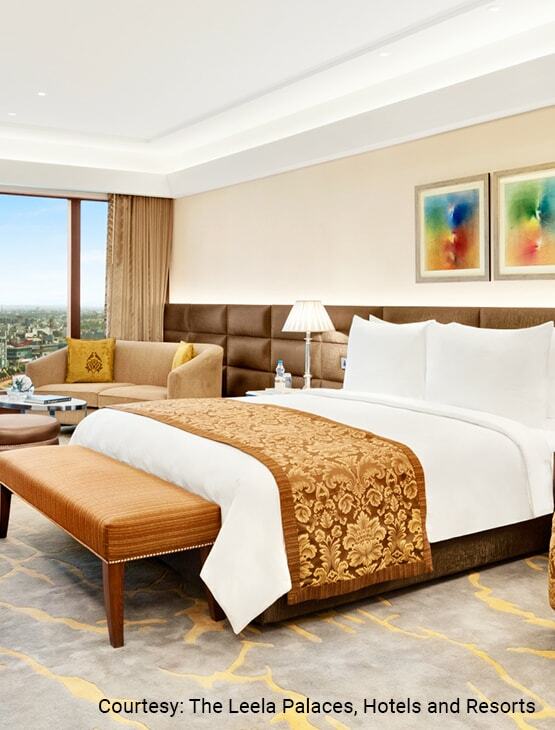 Upgrade to the Silver Level to get additional certificates offering a complimentary room night stay, up to a 15% discount on accommodation packages at selected participating Leela hotels, Special Rate for an upgrade to the Executive Suite and two certificates offering a 50% discount on a table of up to 8 guests. In addition to the Silver Level benefits, the upgraded membership brings to you additional certificates offering a complimentary room night stay, a 50% discount at the Spa, up to a 15% discount on accommodation packages at selected participating hotels and three certificates offering up to a 50% discount for up to 12 guests. 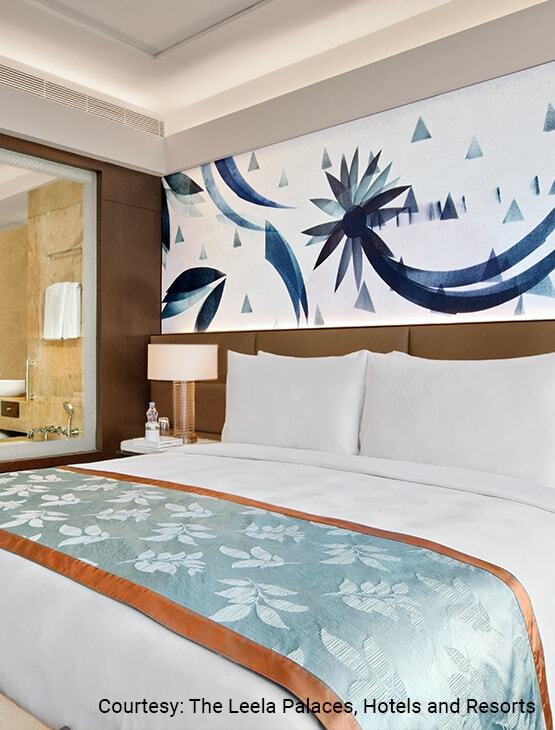 Upgrade to the Platinum Level to get three (3) complementary room night stays in an Executive Suite or 1 BHK Residence Apartment for two guests, in lieu of Standard Rooms. The programme is applicable at The Leela Palace Bengaluru, The Leela Ambience Convention Hotel, Delhi, The Leela Ambience Gurgaon Hotel & Residencies, The Leela Kovalam, The Leela Mumbai and only partial benefits are applicable at other properties of The Leela Palaces, Hotels and Resorts, as listed in the programme brochure. Presentation of the Programme Membership Card is imperative for availing of the benefits under the programme. Card benefits are not applicable at The Leela Palace New Delhi, The Leela Palace Chennai and Le Cirque Signature restaurant at The Leela Mumbai and The Leela Palace Bengaluru. At The Leela Goa and The Leela Palace Udaipur, the discount is 20% on food and beverages. 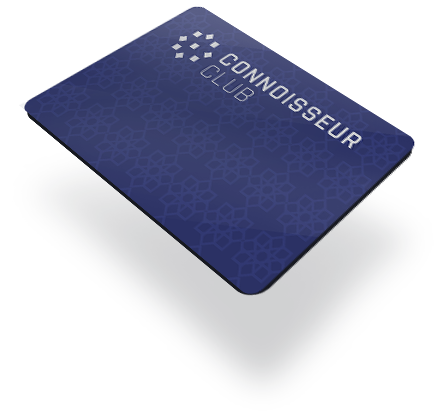 The membership card and the certificates have no cash value and cannot be traded for any other service. These cannot be replaced if lost or stolen. Please refer to www.theleela.com for latest updates. The ‘Hotel’ reserves the right to add, modify, withdraw or delete any of the rules, terms and conditions, the duration of the programme, the participating restaurants, with or without prior notice. All decisions in this regard will be final and binding on the members of the programme. Membership of the programme entitles The Leela Palaces Hotels and Resorts to update and retain information provided by the members in the hotels’ database. Fraud or abuse concerning the Programme Membership is subject to appropriate administrative and / or legal action by the ‘Hotel’ including termination of membership. 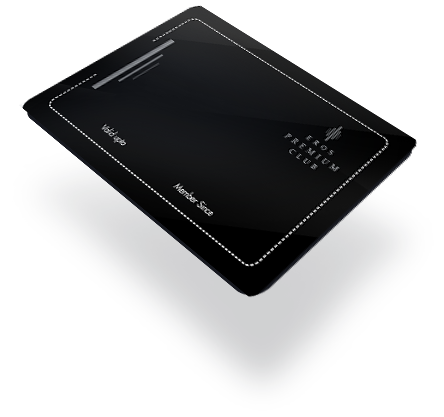 The membership card is valid for use only by the member himself/ herself and after signing on the reverse of the card. Membership card is non-transferable. Membership card and certificates if lost or damaged cannot be replaced. Presentation of the membership card is imperative for availing discounts under the programme. Membership benefits are not applicable on Christmas Eve, New Year’s Eve or any date specified by the Hotel. Membership Card Benefits on dining are not applicable for a stay of more than 5 continuous nights at any properties of The Leela Palaces, Hotels and Resorts. The discount can only be redeemed on the total food order and only one card can be presented per table / party / visit. All food should be ordered during normal hours from the restaurants’ regular menus, including any and all special menus. The value of the specific discount shall not include central, state and local taxes. Children above four years of age are included in the total guest count for the purpose of calculating discounts. In addition to the discount on food, a member is entitled to a 15% (fifteen percent) discount on all soft and hard beverages. 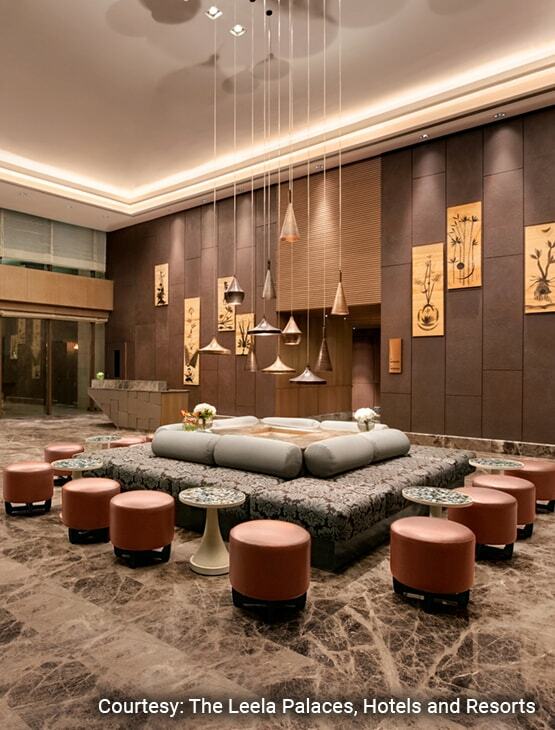 At The Leela Ambience Convention Hotel, Delhi and The Leela Ambience Gurgaon Hotel & Residences, the discount on beverages is 20% (twenty percent). The Leela Ambience Convention Hotel, Delhi – 20% discount on a table of up to 20 guests. 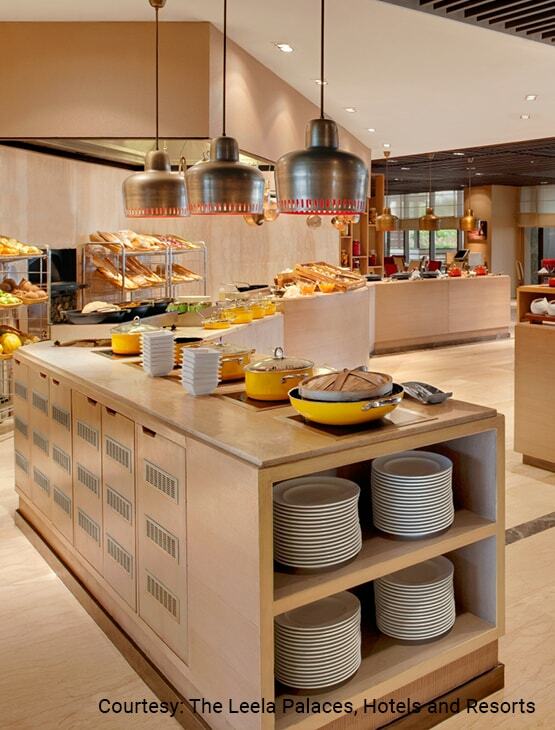 The Leela Ambience Gurgaon Hotel & Residences – 20% discount on a table of up to 20 guests. The Leela Kovalam – 20% discount on a table of up to 20 guests. 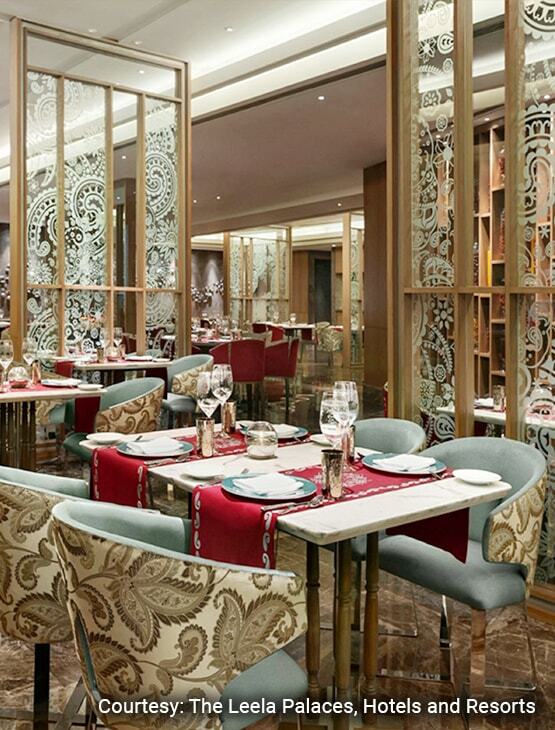 The Leela Mumbai – Regular discounts based on the number of guests on the table. Card discounts are not applicable for special promotions unless otherwise clearly specified by the Hotel. 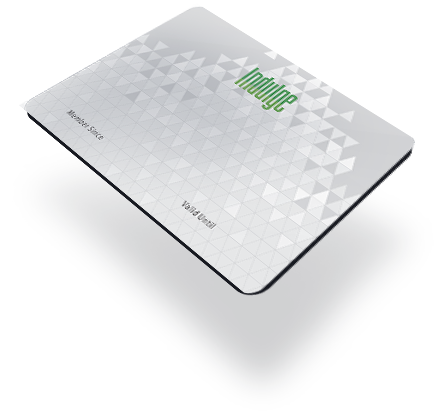 Member Primary card and Spouse card cannot be used on the same visit. The Leela Palaces, Hotels and Resorts reserves the right to reject any membership request without assigning a reason or not offer the card benefits during any special promotion or event. The programme is governed by the terms and conditions mentioned herein, that are communicated to members from time to time, and is subject to the laws of India. Room bookings must be made through the Member Help Desk. Any bookings made through Travel Agents or Corporations are not eligible for discounts. Bookings are subject to allocation availability and prior reservation. 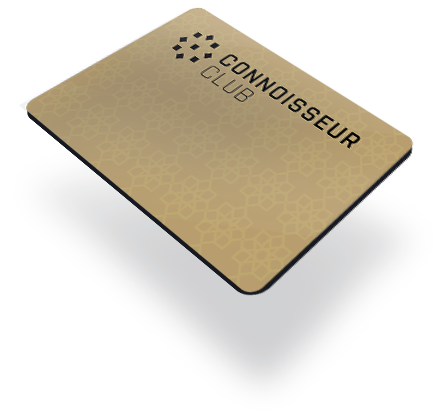 All certificates enclosed in the membership pack are valid for use at the specified hotels only. The certificates are for one time usage and have to be utilised in full. The certificates cannot be exchanged for cash or any other services. The benefits as given in the gift certificate are accompanied by the terms and conditions given on the face and on the reverse of the certificate. These are valid strictly as indicated and cannot be extended or re-validated.